Tintin Heart: It's Decoupage Jim, but not as we know it! Like the title of today's post says, it's Decoupage, but maybe not how you are used to seeing it! Here are a couple of cards I've made for my son's birthday. A huge Star Wars and Comic book fan, the theme for this year's birthday was obvious. The Captain America card was made using a 'free' image from one of the many sites on the web. I usually work with six layers and try to build up each layer to create a '3D' ish effect. 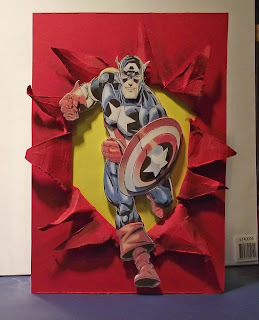 Each layer is popped up with sticky fixers (I always feel like I'm in blue Peter when I say 'sticky fixers') This effect was enhanced with the red cardstock, torn and distressed with StazOn black ink to make Captin America appear to burst through the card. Later I added a black and white frame to really push the image out. Using the strong primary colours that are familiar in comic books, I hope I recreated the right feel for this card. 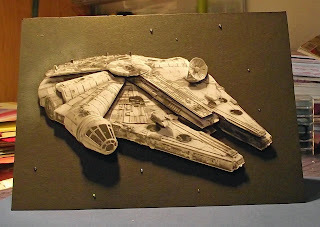 The Millenium Falcon was, again, made with another free image. The six layers were easier with this image as the cutting lines where more defined. Again the layers are built up with sticky fixers and the final image mounted onto black cardstock. The 'stars' are some dots of Diamond Stickles and I created the starship's exhaust with some Color Box chalk ink in light blue. I resisted adding any sentiments to the front of the cards simply because I didn't want to spoil the look. I won't give his age away, but just say ' Happy Birthday' for today Ian. Hope you like your cards. Thanks again for stopping by and reading my blog. Your time and comments are appreciated.